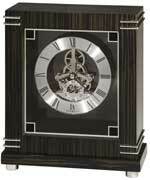 Contemporary wood and metal mantel clock with curved brushed nickel finished metal sides is finished in Black Coffee on select hardwoods and veneers. The white dial features embossed, satin nickel finished Arabic numerals and hour markers, a black minute track, a wood bezel, satin nickel hour and minute hands and a convex glass crystal which keep reflection to a minimum so the dial is always easy to read. Quartz, triple-chime Harmonic movement, plays your choice of Westminster, Ave Maria, or Bim-Bam chimes with volume control and automatic nighttime chime shut-off option. Requires two "C" Duracell batteries (not included). 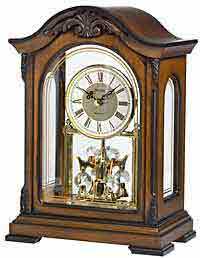 Size: H. 8-3/4" W. 18" D. 4-1/2"
Clocks for sale at The Clock Depot including the 635-159 at discount prices.